Light Screw : Adjust ambient brightness, adjust how dark the room needs to be before the sensor turns on. Sensor Screw: Adjust the sensitivity of the sensor to tune how easily the light is triggered on. 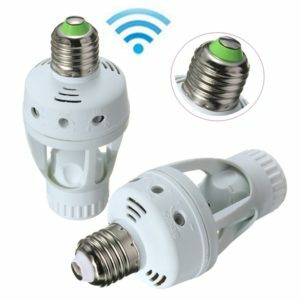 E27 screw Outdoor Light Socket Adapter into a motion detector lamp you can easily with the E27 PIR sensor Outdoor Light Socket Adapter that can be set to activate whenever motion is detected, great for garages, stairwells, security installations or places your too lazy to manually switch on.